You may not realize how many systems and appliances in your house depending on your plumbing system to function properly. If you are like most people, you probably do not think much about your plumbing until something goes wrong. 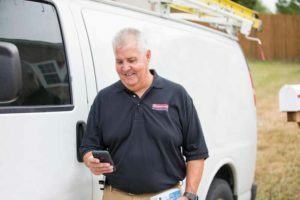 We know you have better things to worry about than leaky pipes or a clogged drain so we make use of all of the latest technology in the industry. This ensures our diagnostic and repair services can be carried out as quickly as possible. Leaking pipes can be a big problem on several levels. The water leaking out of them can cause some serious damage to your home and belongings, and losing that water is likely costing you money every month on your water bill. One of the main problems with leaky pipes is that you do not always notice them right away. And even when you do, it is hard to actually pinpoint the source of the problem. A little drip coming from the ceiling could mean much bigger problems and more widespread damage once you take a look inside. And just because that drip is coming down in the middle of your living room does not mean that the source of it is directly above you. It could be that water is running all throughout your ceiling and only coming down at the weakest point. Regardless of where or how a leak develops, you want to get it taken care of right away. We use high tech diagnostic equipment to find leaks and repair them in a fraction of the time it would take with conventional means. Did you know that a dripping faucet can waste more than 3000 gallons of water per year? Fixing leaks is actually one of the easiest and most effective ways of cutting down on your home’s water usage. Call a plumber today to examine your plumbing system, you’ll be surprised how much fixing all the little leaks will make a difference on your utility bills! There really is no way around it – pipes get clogged from time to time. It is certainly not pleasant to deal with them when they do. But you can make it a lot easier on yourself by calling for help as soon as you realize there is a problem. You don’t have to wait for the drain or toilet to stop up entirely. If you notice slow draining or anything else that makes you think there is a problem down below, just let us know and we can come out and clear the line for you. Your water filtration system is an important part of your home plumbing. It helps to keep the water you use for all types of things safe and properly balanced. When there is a problem with this system, you want to get it taken care of right away. Our plumbers have plenty of experience working with all types of water filtration systems and we have the tools to take care of just about any problem you may have. Let’s get started on your plumbing repair services project. Call Standard Plumbing, Heating, and Air Conditioning or fill out our online form and one of our specialists will get back to you right away. We appreciate the opportunity to earn a 5-star review!